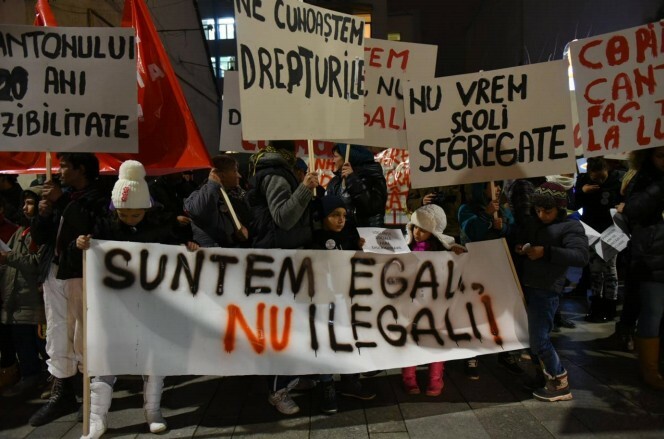 The commemorative action “We are equal, not illegal!” took place in Cluj-Napoca, Romania on 17/12/2015. It involved people from the marginalized ‘residential’ space of the city (called Pata Rat) and from other areas with precarious and insecure housing conditions, as well as local activists for housing justice. This public event was a moment of joint struggle for housing rights. The participants gathered to commemorate their shared histories of forced evictions and housing insecurity, of being driven towards informal and precarious housing, of discrimination and institutionalized racism in Cluj-Napoca. 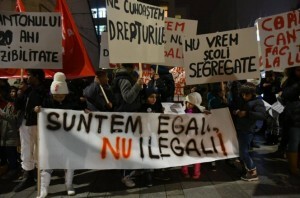 The march passed through central locations of the city where in recent years public actions were carried out to condemn the forced eviction of 76 mostly ethnic Roma families from Coastei street on 17 December 2010. This was another moment in the history of 6 years of civic activism for the right to adequate housing in Cluj. In the cold evening of 17/12/2015 more than 100 people came out demanding the right to life by commemorating 40 years of premeditated poverty in Dallas (old Pata Rat). The workers who came out had spent their life on the landfill. They claimed their right to the city by bringing forward the 20 years of invisibility and exclusion from citizenship of people living in Cantonului street. They were asserting their right to social housing by marking 5 years from the forced eviction from Coastei street and people’s relocation to the modular houses built by public funds near the city’s landfill. They insisted on the need to assure adequate and accessible housing in the name of people living on Stephenson street who for the past 2 years have been living under the threat of demolition. At the end of the event the commemorative plaque of the Community Association of Roma from Coastei was exhibited on a temporary public-private space in order to honor the memory of, and express solidarity with, all the victims of forced evictions. A narrative of the event can be downloaded and read here.